A few months after the United States invaded Iraq, Dubya Bush sent Condoleeza Rice on a whistle-stop tour of US allies. Presumably her job was to gauge how much support was out there and to shore up whatever there was. I was living in the UK at the time and I recall the protests that greeted Rice’s arrival in London. A few days later she touched down in Athens and the news reported a huge demonstration that ended with petrol bombs being thrown at the US Embassy. It occurred to me that there was an important cultural difference on display there. It’s not about which response was right… whether Rice’s visit merited placards or petrol bombs. 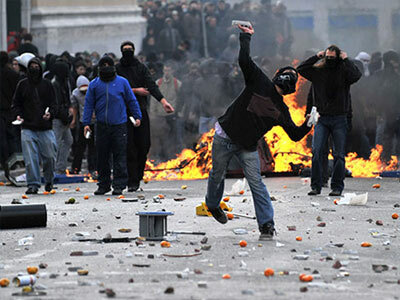 It’s that it takes far less provocation to get the Greeks to reach for the petrol bombs than it does to get the British. This is something that I’ve constantly borne in mind during the Greek protests. The austerity measures being forced upon the Greek citizenry aren’t that much worse than those being forced upon us here in Ireland. But Occupy Dame Street notwithstanding, the Irish citizenry is a long long way from general strikes and petrol bombs. Which isn’t to say that we can’t be pushed to it. Our history of armed uprisings is quite emphatic about that. But we appear to be slower to be roused to such action. Why that should be, and whether it’s for the better or the worse is beyond the brief of this short post, but it’s worthwhile to place the Greek protests in that context. Which is to say… if relatively limited austerity measures will provoke the protests we’ve seen, then the potential for a populist movement toppling the government is very real indeed when you consider the far more draconian measures coming down the line as a result of the “bail out”. Something akin to revolution has been brewing in South-eastern Europe over the past few days. And lest you think I’m guilty of hyperbole, I present two pieces of evidence. One you already know about. Another that’s just been announced and which may or may not catch the attention of the global press. The one you know about is, obviously, the referendum announcement. I was incredulous when I first heard it on the news yesterday. Papandreou couldn’t have created more chaos if he’d started chucking live grenades around the Head of State meeting. First he agrees to the terms of the “bail-out”, then – after every other EU leader holds a press-conference in which they speak of their relief at the deal being finalised and how it would have been disaster for Europe if they’d failed – he goes on TV and retracts his pledge and instead tells Europe he’s going to consult the Greek people. The same people whose response to the current deal includes general strikes and rioting. It seems pretty clear to me that Papandreou arrived back in Athens, fresh from agreeing to the European “bail-out”, only to be met by grim faces. And he was told… “If you do this, your government will fall. And whatever replaces it will not implement that deal anyway”. He was backed into a corner and did the only thing he could; he bought some time for Europe to come up with a way of easing Greece out of the euro as gracefully as possible. How do we know he was backed into a corner? Well, that’ll be the other piece of evidence. A few hours ago the Greek government surprised a lot of people (including those in the military) by announcing a wholesale change of the entire military top brass. The Heads of the Army, Navy, Air Force and National Defence Force were all replaced earlier today. On a day where the Prime Minister is clinging to power by his fingertips, where his government’s majority has been whittled down even further by defections and prominent members of his own party are calling on him to resign. On a day where global markets are plunging as a result of Papandreou’s referendum announcement and European politicians are – not to put too fine a point on it – completely freaking out, does anyone think the Greek government has anything at all on its agenda that isn’t extremely urgent? And there’s not a lot of reasons why the replacement of the military high command becomes urgent. Papandreou has played his final cards. The referendum might turn out to be a slice of political genius (opposition to the “bail out” is running at 62% according to the latest poll I saw… that’s not insurmountable) and the current government may somehow survive within the Eurozone by gaining a public mandate. But in my view, the odds of that happening are significantly worse than those poll figures suggest. With internal pressures beginning to fracture the government and something very strange going on with the military, it seems unlikely that Papandreou will be in power long enough to hold the referendum. And there’s no guarantee that his successor will feel the need to honour Papandreou’s commitment to a public vote. Photo courtesy of The Guardian.